This is the last thing literature professor Peter James wants to hear. Devastated by his divorce from Liddy six years earlier, the two have a tangled history his new partner, Rose, is only just sorting out. But Rose is a patient woman with faith in a well-timed miracle and she’s determined to be sympathetic to Peter’s plight. Together, Liddy, Peter, and Rose have formed a modern family to raise Liddy and Peter’s truculent teen and Liddy’s darling, if fatherless, six-year-old. But when Rose announces she’s pregnant, Liddy’s nanny takes flight, the bill for a roof repair looms, and a high-profile divorce case becomes too personal, Liddy realizes her days as a guilt-free woman might be over. Following a catastrophic prime-time TV interview, she carts her sons back to Ireland to retrace their family’s history. But marooned in the Celtic countryside things are still far from simple, and Liddy will have to come to terms with much more than a stormy neighbor and an unorthodox wedding if she ever hopes to rediscover the real Liddy James. 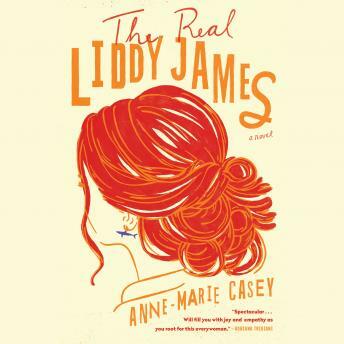 Fun, fearless, and full of heart, The Real Liddy James takes a fresh look at the balancing act every family performs. With the deft characterization and sharp wit that made her first novel an international bestseller, Anne-Marie Casey invites us into the ambitions, passions, and misadventures of this extraordinary heroine.